Now that the presence of downy mildew affecting Impatien plants on Long Island has been established – the question is what should a gardener do? The particular mildew affecting impatiens is Plasmopara obducens . It spreads rapidly, under the right conditions, and once infected, there is no cure. However there are some preventative measures you can take. But first, here’s some background to help you understand the disease. Downy mildew diseases are caused by oomycetes or water molds. They are fungus-like, but more closely related to algae. There are 2 types of downy mildew spores. One type, zoospores, can be splashed up by water or spread by wind. The other type, oospores, reside inside the plant tissue and can spread rapidly and over-winter. At this point, there is no evidence that this particular mildew affecting impatiens is doing that, but why take chances. Downy mildew is more prevalent in the spring and fall, when the cool, wet or humid weather provides ideal conditions. WHICH IMPATIEN VARIETIES ARE AFFECTED? 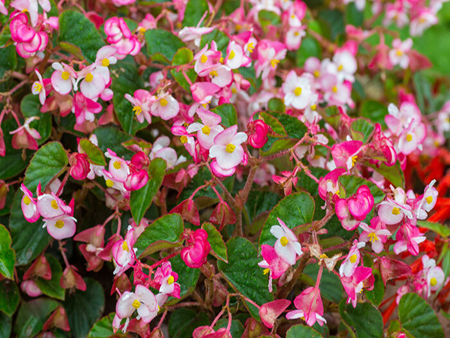 According to an e-Grow Alert by Nora Catlin, Floriculture Specialist, Cornell Cooperative Extension of Suffolk County, the following types of Impatiens are susceptible to downy mildew. All Impatiens walleriana, including the double and mini types. 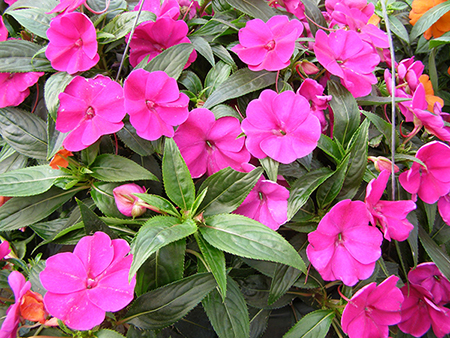 These are the most common bedding impatiens sold in garden centers. (I. walleriana hybrids, like the Fusion® series are less prone, but still susceptible). Balsam Impatiens / Garden Balsam (I. balsamina) These are taller plants than common Impatiens, with elongated, pointed leaves. Jewel Weed (I. capensis) and Yellow Jewel Weed (I. pallida). Generally considered weeds, but if they are in the area, they can spread the disease to your landscape Impatiens. Early symptoms can be hard to spot and might be mistaken for a nutrient problem. 1. Leaves stippled or chlorotic (yellowing) and looking like they need fertilizer. 2. Floppy or downward curling leaves. 3. White fuzzy spots will form on the undersides of the leaves. This usually appear in cool, damp weather. 4. As the disease progresses, plants may stop growing, drop their leaves or completely collapse. Avoiding downy mildew entirely can be very difficult, because so much is weather dependent. High humidity and cool, damp weather cannot always be avoided. But there are a few growing conditions you can provide, so as not to make matters worse. – Provide good air circulation. Don’t overcrowd your plants. – Water from below, trying not to wet the leaves when watering and water early in the day. – Remove any suspect plants immediately. Cultural management is your best bet. Once a plant is infected, there is no cure. If you want to try controlling the spread of the disease with a preventative fungicide, neem and copper sprays are recommended for homeowners. Sweet alyssum, with its dainty, fragrant flowers, is often used in containers and hanging baskets to spill over the edges, creating a soft, frothy look. It’s also a great edging plant because of its tidy, compact habit. Regardless of how you use it, sweet alyssum does best in spring and fall’s cool conditions (or use it for winter color in very warm climates). 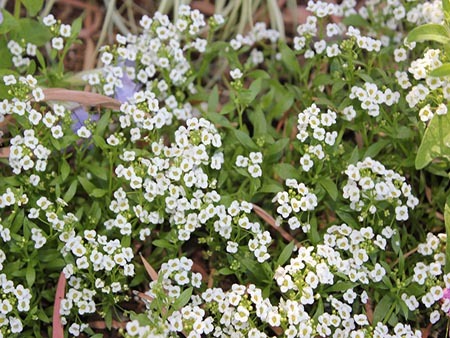 In cool-summer conditions, such as the northern third of the United States, sweet alyssum will bloom steadily through the summer. It halts bloom in summer in warmer areas. 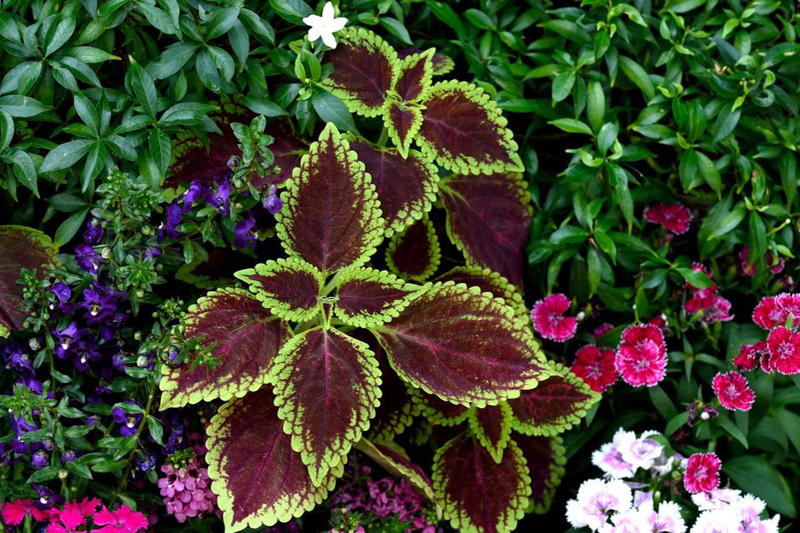 Shade-loving coleus with blended leaf color provides vivid color and wild markings even in the darkest corners of your yard. The mottled colors often change in intensity depending on the amount of sunlight and heat. These varieties are easy to grow — just plant them in a shady but warm spot; give them enough water to keep the soil moist, but not wet; and add a little fertilizer. Exotic fuchsia is a fascinating flower, with lovely hanging lanternlike flowers in magentas, pinks, purples, and whites. If you’re lucky, your fuchsia will attract hummingbirds. 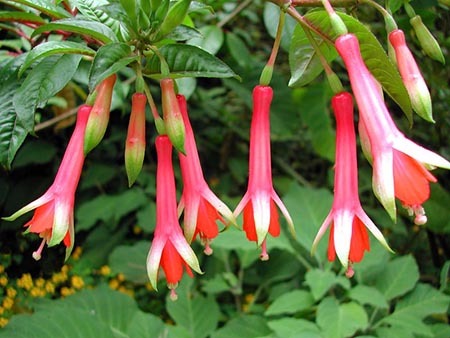 There are several types of fuchsia on the market. The most familiar to many gardeners are those grown in hanging baskets in the North. Recently, plant breeders have released a series of upright fuchsias with smaller flowers, often in shades of orange and red. Fuchsias are actually tender perennials grown as annuals outside tropical regions. 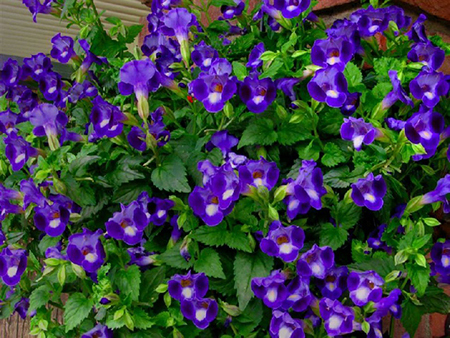 Plant them outside in spring after all danger of frost has passed. They need rich, well-drained soil and ample moisture. They do best in areas with cool summers; they don’t like heat, humidity, or drought. Hypoestes are delicate care-free annuals that make a spectacular ground cover or border plant. Seeds sprout easily and plants grow quickly, requiring very little pruning or maintenance. They prefer partial shade and will reseed freely in warmer climates. The plants produce terminal, spike-like racemes of small, tubular pink or blue flowers in late summer or fall (even as house plants if given long enough light exposure) but the flowers are not very showy and are easily overlooked. Hypoestes require lots of water whether grown indoors or out, and are excellent candidates for hydroponics and passive wick watering systems. 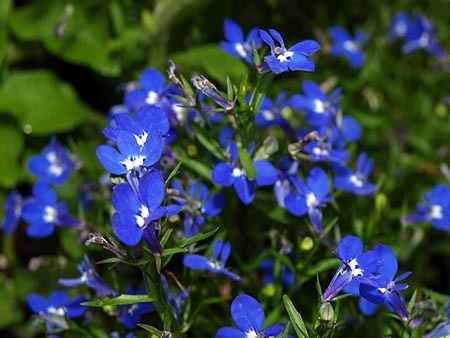 A family of well-cultivated species in a variety of colors, sizes and seasonal growth patterns, lobelia offers something for every gardener to enjoy. 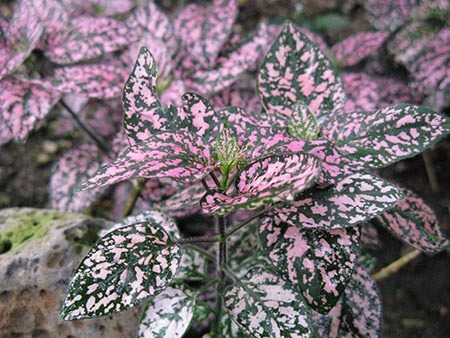 This plant prefers partial shade and has several differnet options such as from tall spikes bearing scarlet red blooms to trailing, low-mounding bright blue buds, lobelia also comes in white, pink, and purple shades of flowers. Like their more common cousins, New Guinea impatiens provide hard-to-find brilliant color in shade. And it’s not just the flowers. The foliage is often brilliantly, exotically colorful as well. These tropical plants really shine in containers, where they thrive in the perfect soil and drainage, but they also do well in the ground as long as you take the time to improve the soil and work in plenty of compost. Try this enchanting little wishbone flower, also dubbed clown flower for its vividly marked flowers that are said to resemble the face of a clown. It’s a wonderful, relatively new choice for shade. The flower shape resembles tiny snapdragons, mouths wide open and showing off delicate throats marked with a contrasting color.